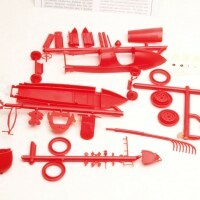 The 27-piece Ed Pink Hemi is likely one of the best representations of this type of mill in 1/24 scale. It’s much better detailed than the Hemis in other Monogram drag racing kits of the ‘70s, including the Snake and Mongoo$e funny cars and dragsters, and the Cop Out Duster (which really only is the Mongoo$e Duster with a light bar!) Some of the nicer features of this engine unit are the two-piece Lenco transmission, the nicely done valve covers with indentations for the breather units, the blower and intake manifold already pre-drilled for fuel lines, and the one-piece header units with support bar in place and the ends pre-drilled. Monogram tried something new with this kit back when it (and its Snake double) was released in 1974–engine wiring and plumbing molded in flexible polyurethane, and that has been repeated here in this reissue. The parts include the distributor/magneto top with all eight wires molded in place, the oil lines that connect to a pair of externally-mounted oil filters, and the fuel lines (a one-piece unit) encompassing lines to the tank, the fuel pump, lines to the distribution blocks, the lower fuel lines, and the upper fuel lines. 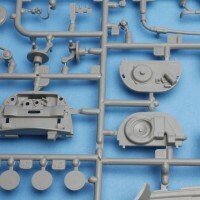 As I said before, these are molded on a sprue of gunmetal gray polyethylene. 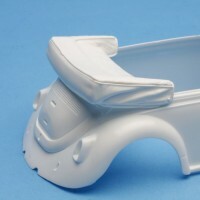 Poly- ethylene is a very flexible plastic, but paint generally does not stick to it very well. 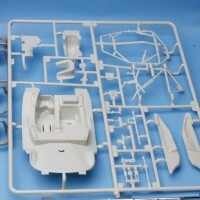 There are ways of priming the material–I read once that coating it with thinned white PVA glue works–but I cannot attest to the success of this or any other method. 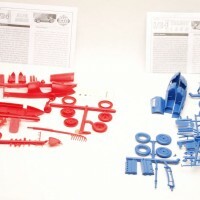 Some of us will likely deep-six the polyethylene parts in favor of doing things the “old school” way–with wire, some parts from the aftermarket and /or parts box, and a little bit of scratchbuilding–and that’s fine too. 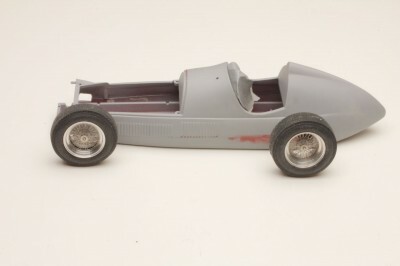 The Don Garlits rear engine dragster chassis is a one-piece molding with one separate stiffener, side mounted airfoils, and one separate bulkhead/ support–a real testament to Monogram’s ingenuity back in the “good old days.” There are some mold lines here that you’ll want to take some time to clean up. Front suspension is a four-piece assembly based on a chrome tubular dropped front axle, to which attaches a three-piece airfoil. At the rear is a five-piece solid-mounted axle with disc brake calipers, the main section of which is chromed. Also at the rear is an eight-piece airfoil/support/parachute pack assembly–nicely done all in all, though you may need a bit of filler on the underside of the airfoil section. The fuel lines (see section above) attach to a separate plated fuel tank. 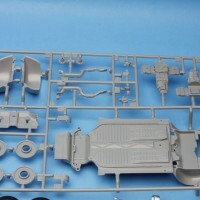 Interesting that there is an extra front tube axle on the chrome sprue, a bit longer than the one intended for use here. At the front is a pair of motorcycle-thin skinny O-ring tires mounted on two-piece chromed Cragar SuperTrick wheels. 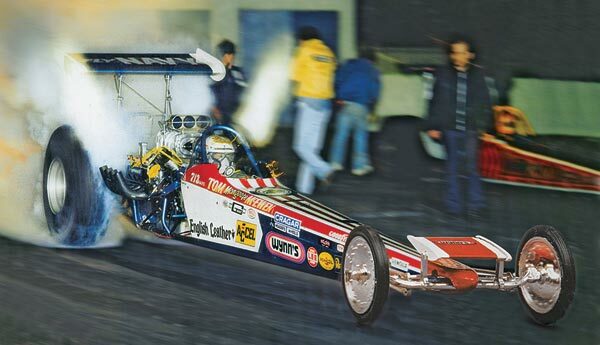 At the rear is a pair of large no-name slicks mounting on a pair of two-piece deep-dish plated Cragar SuperTrick wheels. M&amp;H and M&amp;H Racemaster white tire markings are provided on the decal sheet for the slicks. 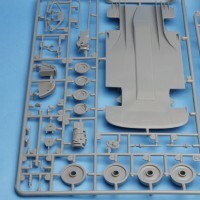 Note that on the vinyl sprue with the slicks, you get a free pair of Pro Stock/Pro Mod front tires. 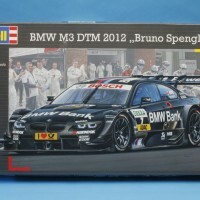 Hello, spares box! 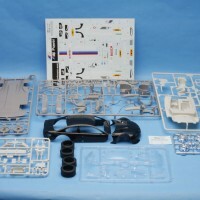 INTERIOR: All the requisite dragster interior components are here: butterfly steering wheel and column attaching directly to the front axle steering gear, pedals, shifter, and brake lever. 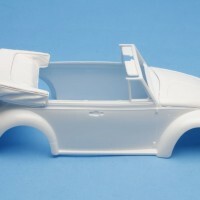 The seat and associated roll cage is a three-piece assembly, however, there is no seat detail, upholstery, etc., as Monogram provided a four-piece driver figure intended to fill that space. 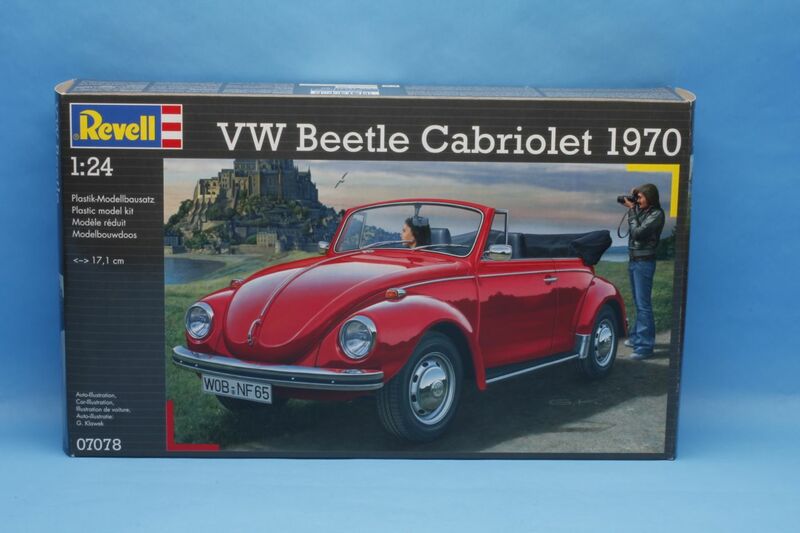 If you don’t want the driver figure, the seat itself and its associated upholstery must be scratchbuilt, including the belts and harnesses. The seats from nearly any of the 1/25 scale rear engine dragster kits available over the years from AMT, MPC, or Revell are too small, but can be used as a pattern to scratchbuild a new seat. BODY: The basic body comes in two sections: one-piece lower and three-piece upper, which removes to show the internal detail. Simple but effective. Not much more to be said here except make sure you remove the mold lines on the upper body unit as they are quite prominent. 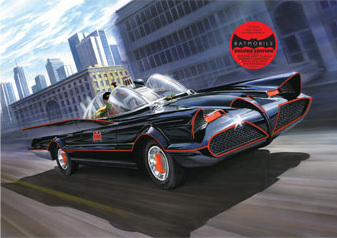 DECALS: The decal sheet provides all the markings necessary to replicate the Mongoo$e’s late-1974-75 English Leather-sponsored ride. Well printed and thin, the decals are of excellent quality. 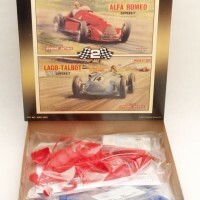 Included in this kit is an excellent six-piece Chrondek “Christmas tree” timer that works nicely in a diorama setting of a dragstrip starting line. PRE- STAGED, STAGED, and CHRONDEK TIMERS letting in white is provided on the decal sheet for this accessory. Also included is a two-piece standing crew figure with his hands over his ears! The Del Ray’s 29-piece engine represents a 265 smallblock with Powerglide automatic, and is extremely well done. Engraving throughout is superb. 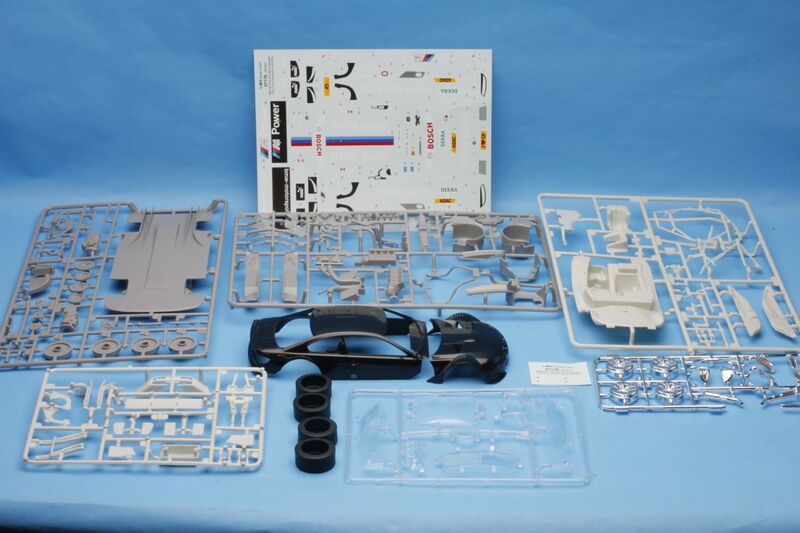 The instruction sheet does not mention at all that stock engine pieces are in the kit (a faux-pas to be sure, Revell), however, we will take those parts into consideration in this review. 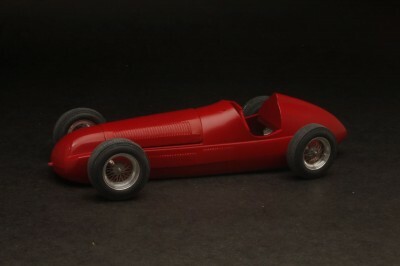 Of special note are the separate starter, fuel pump, front cover (with engine mounts), water pump, distributor with vacuum advance and separate coil, oil filler tube, upper and lower radiator hoses, and the correct-for-1956 exhaust manifolds–the familiar “ram’s horn” style did not come into widespread play until the advent of the 283 a year later. 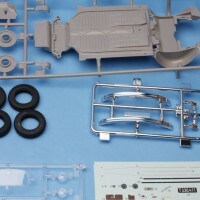 Only one intake option is provided, a single four-barrel carb, with a choice between a two-piece stock single-snorkel air cleaner (not mentioned in the instructions, but on the sprue) or a custom two-piece plated “pie plate” low restriction air cleaner. 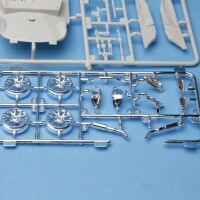 There is also a choice between a stock generator (on the sprue but not mentioned in the instructions) and an alternator. 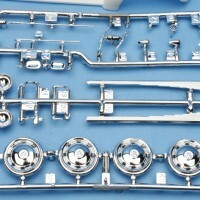 For valve covers, you have a choice between stock Chevy script type (on the sprue but not on the instructions) and a pair of custom finned chrome units. 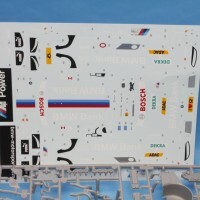 A decal is provided for the oil filter. 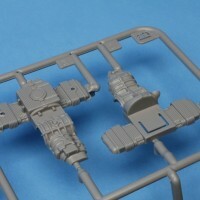 This is one first rate Mouse motor, and the Powerglide on the end is a real plus for kitbashers. Spend some quality time wiring and detailing it and you have an absolute contest contender. 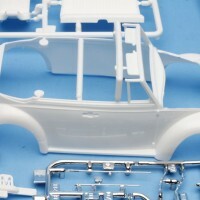 The one-piece chassis pan has frame and floorboards molded in place plus a separate gas tank/spare tire well component. 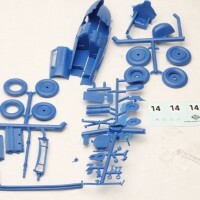 There are two different front suspensions: a five-piece stock unit (on the sprue but not on the instructions) and a five-piece custom assembly with molded-in large diameter disc brakes. 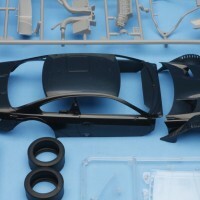 There are also two different rear suspensions: a seven-piece stock setup (again, not mentioned in the instructions but on the sprue) and a nine-piece custom assembly with molded-in large diameter disc brakes and raising spacers. Exhaust system is two-piece, requiring only drilling out at the ends. 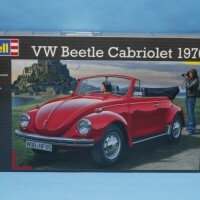 The underhood area is well catered to, with a detailed two-piece radiator unit, detailed firewall, separate washer bottle, two-piece battery and tray, wiper motor, twin horns, and master cylinder. 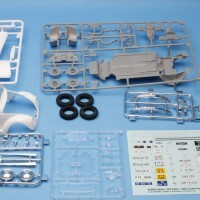 Decals are provided for the radiator tank top, battery top, and the washer bottle top. 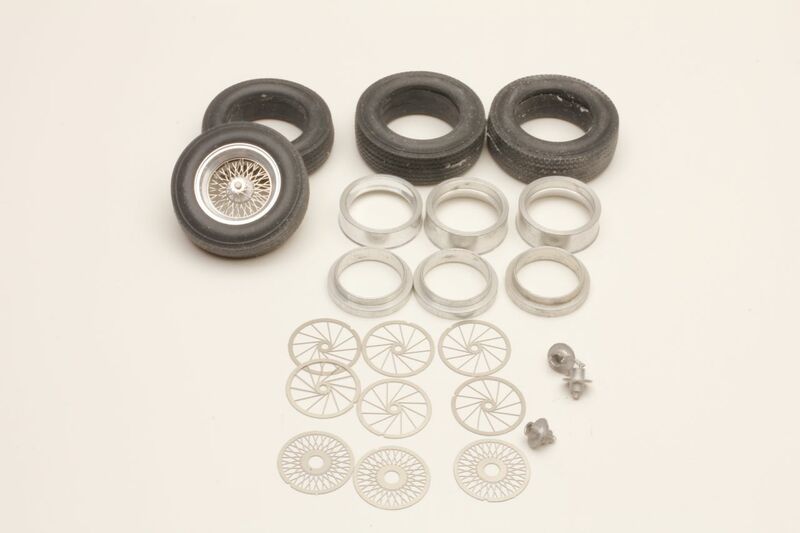 18” O-Z style hollow five-spoke wheels ride on black vinyl wide low profile no-name tires. 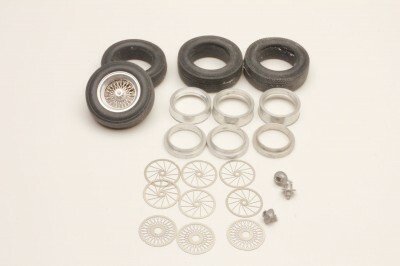 The stock steelie wheels and chromed dog dish hub caps are still here on the sprues (no mention of these at all in the instructions) and are only missing the proper tires to mount them. 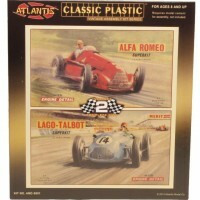 These, of course, can either be borrowed from another kit, or found in resin from an aftermarket supplier. The interior is platform style, building up off a basic floor that has the gas pedal, rear seat, and package shelf molded in place. 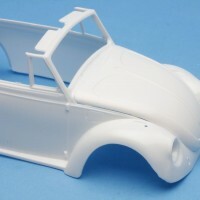 Side panels are separate and have excellent three dimensional detailing. The two-piece front bench seat and molded-in rear seat have excellent upholstery engraving. The dash is a six-piece affair with a chromed central trim insert, chromed under-dash tissue dispenser, steering column with shifter and turn signal stalk, and stock steering wheel with molded-in horn ring. 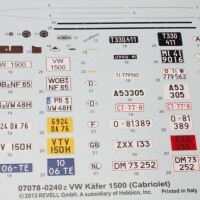 Decals are provided for the main instrument cluster, radio face, Bel Air speaker panel, and clock. The headliner is also catered to, with a separate clear dome light. Revell did a superb job with the body on the Del Ray. 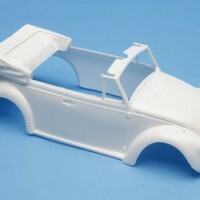 The one-piece body has the correct side trim and “Chevrolet” scripts molded into the sides, however, they are very light and almost certainly will get lost under a decent paint job. 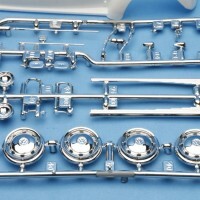 At the front is a plated grille with separate clear turn signal lenses, plated headlight bezels with separate clear lenses, front valence panel, plated bumper, and optional license plate frame. The hood has separate hinges and very light underside engraving, and on the outside has a separate Chevy crest, V emblem, trim strip, and hood ornament (all chromed). At the rear are a plated rear bumper, two-piece taillight units with red clear lenses, a plated Chevy crest, a plated V emblem, and an optional license plate frame. 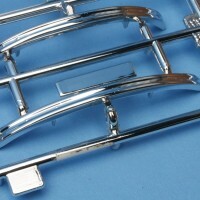 Door handles, radio antenna, wipers, and two-piece rear view mirror are all separate chrome pieces. All window transparencies are commendably thin and clear. 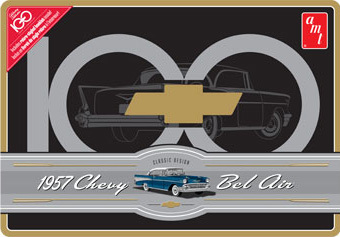 On the decal sheet, in addition to the items mentioned earlier, are flame designs in yellow for the body sides, two black Chevy bowtie outlines, a silver “California Wheels Pro Touring” motif, two silver Chevrolet scripts for the rear flanks, two silver front fender hash mark trim, two Chevy crests for front and rear, and two California FIFTY6 plates.